All of us can sure make use of some piece of assurance, practical things we can do when faced with things in life that don’t make sense. Luisa Ampil gives us just that in her 175-page book, “What Women Can Do When Life Falls Apart.” Each story is packed in no more than 5 pages, short and sweet but straight talk. The best thing about this book is the fact that Ampil has lived its message. I strongly believe that it is what makes any book credible. You have just reached the end of your rope. Is there any more reason to hope? Where could a woman like you braving through health, family, career, self-esteem and other personal issues turn to for help? Luisa Reyes-Ampil shares her own experiences and those of other women whose lives were turned upside down when difficulties came. Brimming with inspiring and practical advice, this book will lead you to where you can find the answers. Life may feel like it’s falling apart but you can still remain whole. No matter what your circumstances tell you, there’s hope for survival and victory. Luisa Reyes-Ampil is involved with Guidelines International Ministries as Assistant Director of International Ministry and Administrative Assistant for President and Founder Harold J. Sala. She has been joining and leading mission trips since 2009 and occasionally teaches and speaks to various groups. She has earned her certificate in Biblical Counseling from the American Association of Christian Counselors. While living in the Philippines, she had a successful hotel career with The Peninsula Manila and the Shangri-la Hotel Makati as well as in retail marketing and promotions with Rustan’s Commercial Corporation. She and her twin daughters, Christiane and Christelle, are now based in the US where they have been living for 15 years now. All of us can identify with one of the many stories Luisa shared in her book. In a nutshell, “What Women Can Do When Life Falls Apart” is a compilation of stories of the author herself, while some are of her friends who entrusted her with their own struggles and others are those of the women she counseled as she works at Guidelines International as Harold Sala’s right-hand person. An easy-to-read book packed with real stories of women. You can very well guess that I love best those stories with victorious and happy endings but we all know that it won’t be much of a book of true-to-life stories if it was only filled with just that. Otherwise this book might as well fall under the Fairy Tales department. Some stories are in fact, works-in-progress, some do not even have happy endings. But I love how Luisa gives practical advice and encouragement in the “What You Can Do,” portion of every story, ushering the reader to a list of godly response to particular hardships and how the Lord can come through for us regardless of our circumstance. Each story is wrapped up with an encouraging verse from the Bible that we can hold on to in difficult, seemingly hopeless times. What Women Can Do When Life Falls Apart is a hope-filled book. While we sure do not have control what life throws at us, we are assured of one thing – we are not alone and we have a choice what to make of the lemons that we’re given. 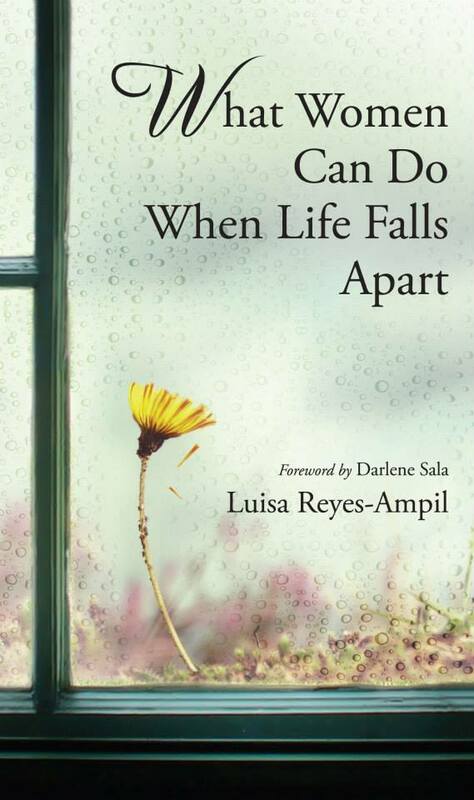 What Women Can Do When Life Falls Apart by Luisa Reyes-Ampil is available at OMF Lit Bookshops and through OMF e-store. Disclaimer: This book was given to me by OMF Lit in exchange for an honest review. ← Fun at the Play Date Soon 2014!